At a press conference at Wimbledon in July, a reporter asked Serena Williams how she felt about going down in the history books as "one of the greatest female athletes of all time." She responded simply, "I prefer the words 'one of the greatest athletes of all time.' "
With just a few words, the winner of 22 Grand Slam singles titles was able to combat the subtle sexism that permeates how female athletes are treated by the media. Now, just two months later, Nike uses that moment as inspiration for its latest 60-second spot, a celebration of all that makes Williams great, timed to the U.S. Open. 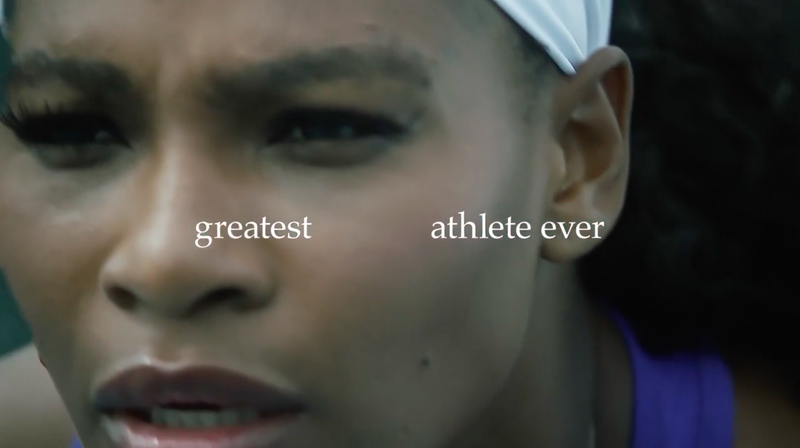 The spot, part of Nike's "Unlimited" series from Wieden + Kennedy, goes a step further in its assessment of Williams, deeming her the "greatest athlete ever" (after striking the word female from its own onscreen copy). The ad uses the just a few of those on-screen words to condense Williams' many accomplishments into an easily digestible narrative (even if it's cryptic at first). The creative is stripped down, which works, though it might have benefited from more visuals matching the captions. Film is a visual medium after all. There's also a cool out-of-home component to the campaign. The company also gathered a variety of athletes, as well as comedian Kevin Hart, to send a message of support to Williams as she competes at the U.S. Open (see below). The messages are clearly sincere and heartfelt, which makes the video—it's an ad, after all, so they're all prominently wearing Nike gear—work better on an emotional level.